Make Gem Necklaces for Christmas Gifts! Easy & Fun to make! 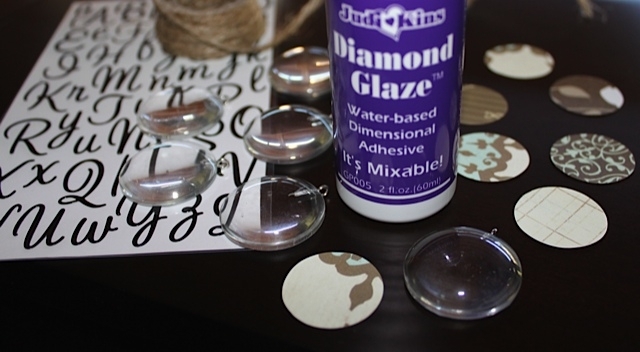 Simply attach 1″ Circle (paper or photo) with Diamond Glaze to Gem. Allow to dry & string with Twine or Ribbon. Optional: Attach ABC Sticker for Initial Necklace. Cost is only $2.00 per necklace with kit (Makes 6)! 1) Clean both sides of Clear Gem with a dry cloth. Apply a thin layer of Diamond Glaze Adhesive to the back side of gem. 2) Attach 1″ Paper or Photo Cricle face down on back of gem. 3) Apply a thin layer of Diamond Glaze over the back of the paper/photo. 4) Let dry for a few hours. String with Twine, Elastic, or Ribbon. That’s it! Just a Clear Gem w/Hook, a 1″ Pattern Paper Cirle, & Natural Twine!